Any product and material show different properties at different environment. So for checking the properties of any material and product a Standard Temperature & Humidity required for that particular product, and same can be measured with the help of Conditioning Chamber. - SK Equipments has renewed Conditioning Chamber with New Technology for Maximum Accuracy in Humidity & Temperature. - Natural Water Shower Technique for Humidity. - Range: Temperature 22 ±1 C & humidity 65±3 % can be easily attended. - 600 x 600 mm Stainless Steel Chamber. - & outside Body of MS with Powder coated finish. - Temp. – 0 -50ºC. + 2ºC. 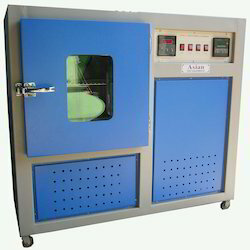 Hexaplast Conditioning Chamber is used to determine the effect of specified environmental condition. 18 x 18 x 18 With double walled construction Inside Chamber of SS 304 of Size – 18 X 18 X 24 And outside Body of MS with Powder coated finish. Temperature & RH% Range: Temp. – 20 -60ºC. +2ºC. RH - 40% to 90% + 3% RH The equipment is provided with Digital Temp. & RH % Indicator Controller. We deals in Conditioning Chamber. We manufacture and supply a wide range of Conditioning Chambers for our valued clients. These chambers are manufactured using finest quality raw material that is sourced from trusted market vendors. 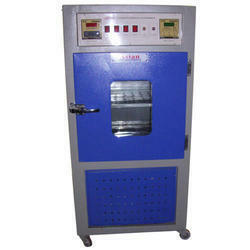 Our range is extensively used in various industries for conducting Cold Impact test & Cold Band test & Conditioning Test. Riding on vast volumes of expertise in this arena, we are occupied in offering Lab Testing Instruments. - temperature range 15 To 40 C digital display and controller.